Those who want to attest documents from ministry of foreign affairs should be aware about authorities of the ministry and procedure and nature of documents that they attest. 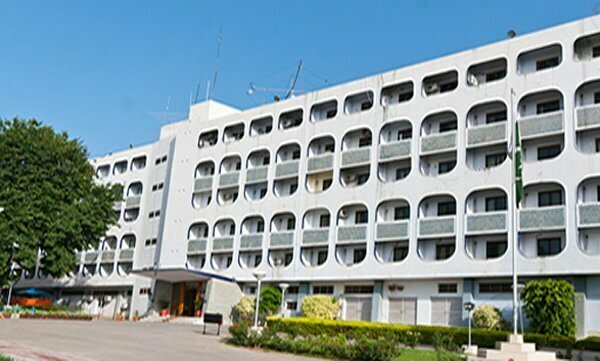 The main office of Ministry of foreign affairs is in Islamabad and its camp offices are located at Peshawar, Lahore, Karachi and Quetta. Documents attested/issued by authorities of provincial, central and local government that are intended to be used abroad or submitted in Foreign Missions in Pakistan. It also includes the verification or attestation of the documents of Foreign Missions which are intended to be presented in Pakistan. Ministry doesn’t attest documents which are in any other language than urdu and English. The documents once attested from MOFA will remain valid forever and hence will not need to be re-attested. It is pertinent to mention here that Photocopy or translation of any document will be attested when original document is presented or it is attested by a gazetted officer of BPS-17 or above. S. No. Office Address Tel. No. 1. Nikah Nama (Urdu) Rs. 5 Seal of Nikah Registrar; copy may be issued by concerned Secretary Union Council or Chief Officer or Tehsil Municipal Officer or Executive Officer of Cant Board. PMDC Reg., etc. Experience Certificates Rs.25Rs. 5 All the documents have first to be attested by the Ministry of National Regulations and Services. The MBBS degree has to be attested by HEC. Nursing Diplomas etc.Experience Certificates) Rs.25Rs. 5 All Nursing related documents first have to be attested by the Ministry of National Regulations and Services. 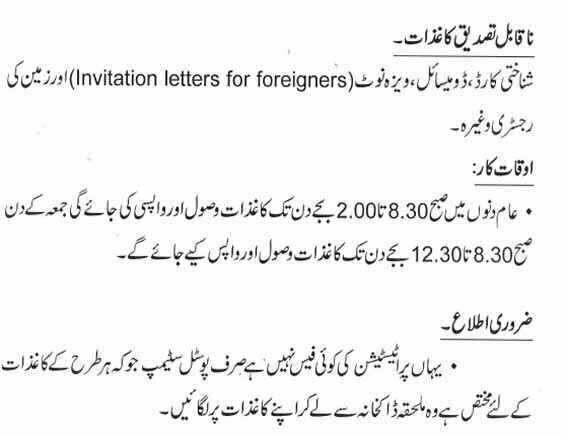 The applicant himself/herself or his/her family member with authority letter can present documents at MOFA. The person appearing on behalf of his relative is required to show his/her original ID card/Passport/Driving License/University Card/School Card/Domicile/Office Card or any of his valid ID. If a person has no family member or relative available in Pakistan to appear on his/her behalf, in that case the applicant is required to produce an authority letter duly signed by our Mission abroad to the authorized person to be brought at the counter along with other related documents. Once the document is submitted for attestation on window the document is likely to be attested and returned within two hours after submission. Note: Expenditure on stamps to be affixed on documents will be borne by the applicant. Note 2: In case of loss of documents courier companies will be responsible for that and will have to bear all the charges that is needed to get another original document. Will MQM be banned under Current Scenario? When verifying registration of marriage certificate the ministry has put a red stamp which saysCounter signed only. Ministry of Foreign affairs is not responsible for contents of document. Can this stamp have a negative impact on issuance of U.K. visa. sir, i want to attest my ONE YEAR Diploma of surveror from UAE Embassy in islamabad. I have to attested bill statement of govt hospital as need to claim the amount for overseas insurance company but your dept refused it. Kindly guide me what is the process. Dear Sana first attest intermediate Certificate from IBCC Lahore board. After that Attest from foreign Affair. At the end attest from embassy where you want to be going.If any confusion then contact me. want to attested graduation & master dagree, kindly guide me. We need to attest commercial documents like “Free Sales Certificate” and “GMP Certificate”. Please advise shall we send our rider to get attested those documents after chamber attestation at your office. I have got attested my copy of matric and fsc from IBCC and BS and MPhil from HEC Islamabad. Now I want to get attest it from MOFA. What is fee per document ? from where we can get “Stamp Tickets”, is it available near to MOFA office?